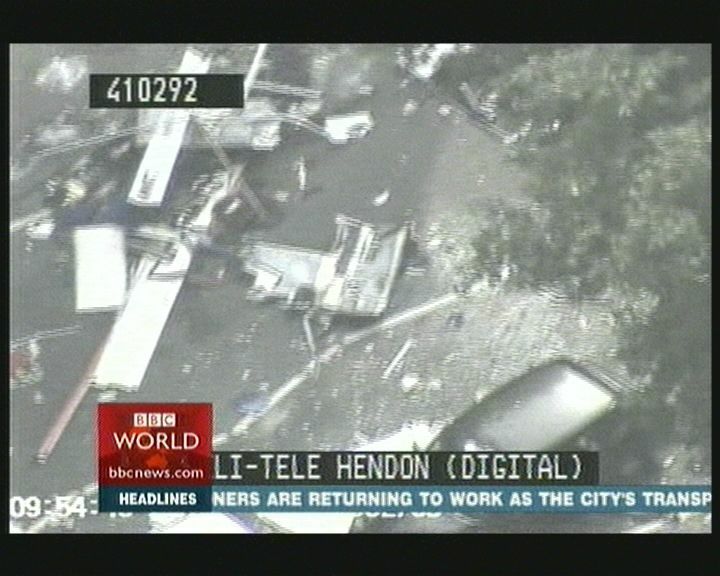 The following seven stills are from Metropolitan Police Service Heli-Tele footage that was captured and broadcast on BBC World at some point after the 9.47am explosion of a diverted number 30 bus in Tavistock Square on July 7th, 2005. It is interesting to note that Sky News was ordered to pull its helicopter out of the skies shortly after the explosion of the bus. A rudimentary two-second analysis of the scrolling text at the bottom of the first two pictures gives : "LONDONERS ARE RETURNING TO WORK AS THE CITY’S TRANSPORT NETWORK RESUMES SERVICE AFTER THE BOMB ATTACKS", which would doubtless take considerably longer than seven minutes. Extrapolating from the fact that people tend to return to work in the mornings and not at the weekend, I'd say the mostly like date for this footage would be Monday, 11th July. I believe the bus wreckage was finally removed from the scene on 17th July, but perhaps someone with plenty of spare time could find conclusive evidence of that date. Now perhaps the conspiracy muppets would care to bugger off back to Neo-Nazi land? A slighty off point issue but: What has Neo-Nazism got to do with research into staged terror events? Actually a fair amount but not in the way you seem to be implying. The European Neo-nazi movements of the 1980s and 90s were mostly formed and operated by British/NATO intelligence systems. Webster Tarpley has done detailed work on this issue. There is the small point, which the first commenter appears to have ignored, that July 7th 2005 happened to be a Thursday, meaning any 'return to work' would have occurred the following day, a Friday. However, this still does not help with pin-pointing the date on which the footage was captured by the Metropolitan Police Heli-Tele, nor does it explain the inordinate amount of evidence, shown in the photos, that is left exposed to the elements. 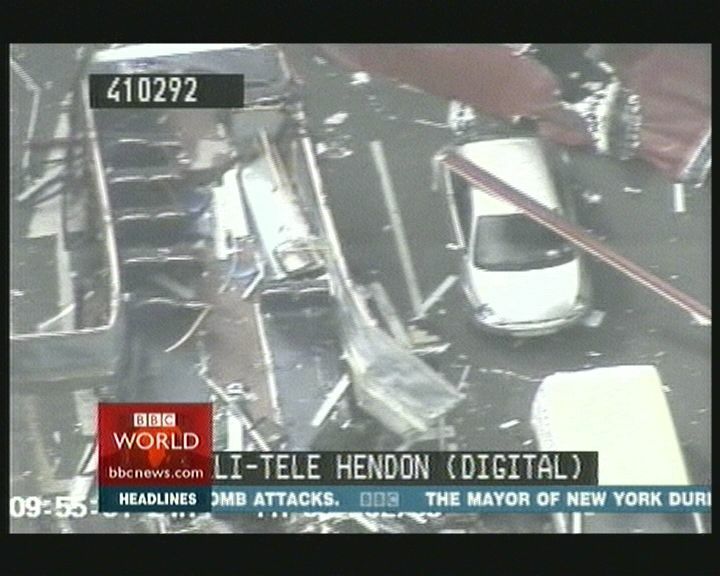 For a time, although I can no longer find a link, the BBC had a stream of Metropolitan Police Heli-Tele footage taken on the day. 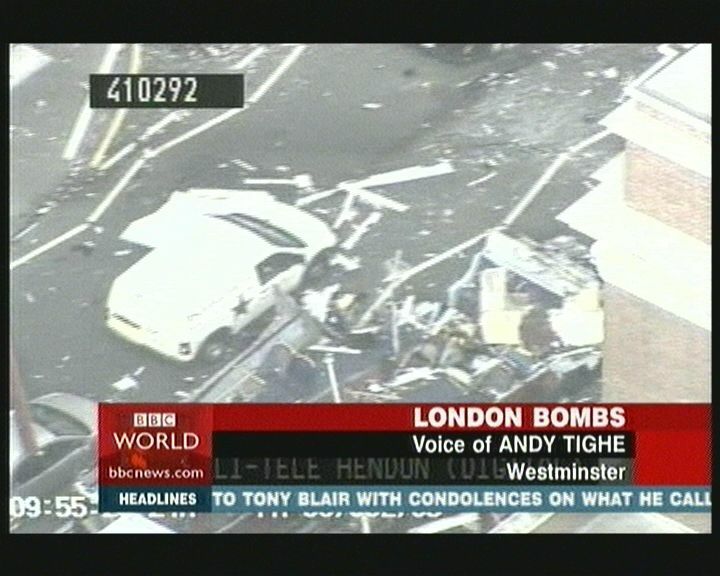 There was a gap in coverage of over 20 minutes from shortly before the bus explosion at 9.47am until about 10:10am. 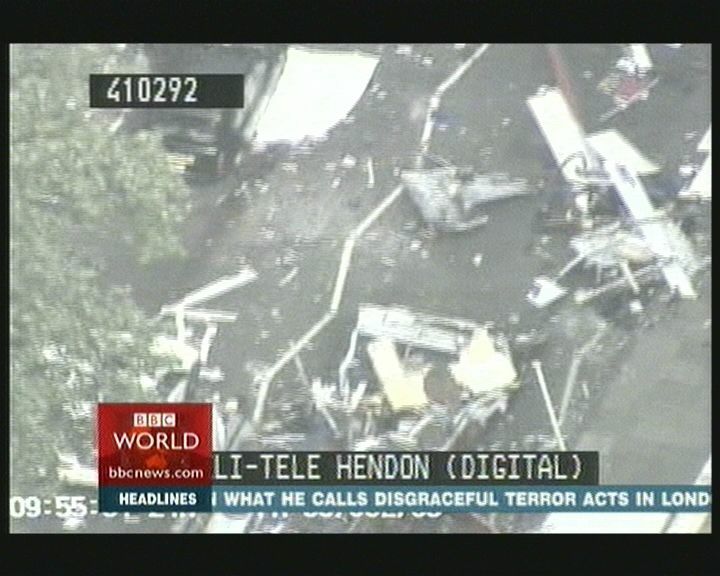 Shortly after the bus explosion, at 10:36am, Europhobia's liveblog reported that the Sky News' helicopter was prevented from filming the area. A simple explanation is always less attractive than one which looks for a conspiracy. 1. The 3 tube bombings occurred at 08:50. A police helicopter was either scrambled shortly after from Hendon Police Training Centre in north London, in order to monitor the situation over central London, or maybe it was already airborne in the normal course of its activities over London. 2. The bus explosion occurred at 09:47 on 7 July. The police helicopter was alerted to the location and takes aerial photos 7 minutes later at 09:54 - as shown on the first and second images. 7 minutes is plenty of time for a helicopter to reach Tavistock Square from any point in the sky over central London. a) "LONDONERS ARE RETURNING TO WORK AS THE CITY’S TRANSPORT NETWORK RESUMES SERVICE AFTER THE BOMB ATTACKS". I can confirm this because I commuted to London on 8 July and travelled on the Central Line, though there were very few passengers. IIRC, the Circle, Metropolitan, Hammersmith and City, and Northern (City Branch) lines were still closed from the previous day's events. My normal journey would have been on the Northern (City branch) line, however because it was closed I had to take the Northern (Charing branch) line and then the Central line. b) "IRAQI LEADER WRITES TO TONY BLAIR WITH CONDOLENCES ON WHAT HE CALLS DISGRACEFUL TERROR ACTS IN LONDON". 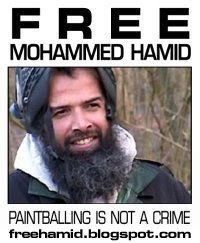 There is a BBC News report dated 8 July 09:36 GMT, 10:36 UK) on this at http://news.bbc.co.uk/1/hi/world/middle_east/4662589.stm. 3. 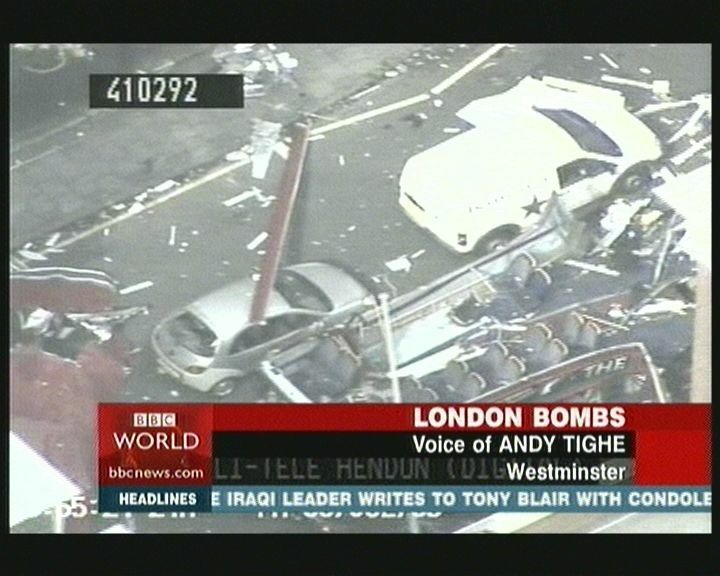 BBC and Sky scrambled their own news-gathering helicopters on the morning of 7 July. However, with the police helicopter also airborne and all 3 helicopters covering a small airspace, it is quite understandable why the police would order one of the media helicopters to stand down. No need for conspiracy theories there then. is that he was unable to detonate his device with the original battery. But we have no further evidence on this at this stage. 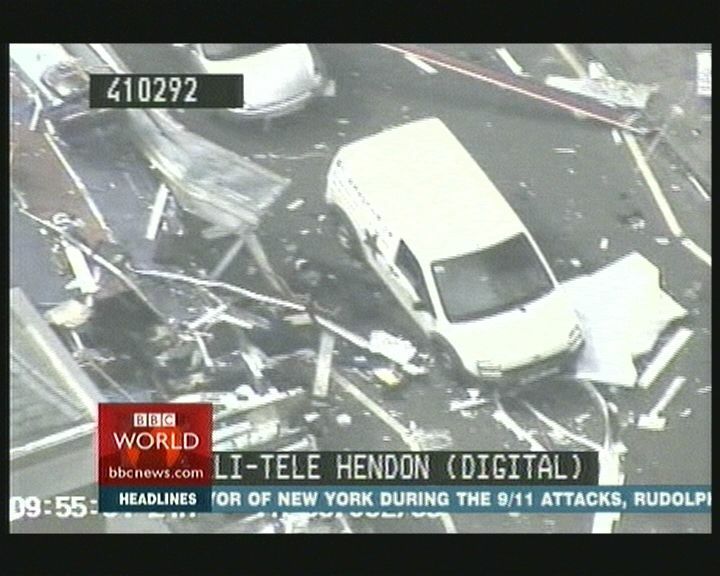 09.47 is given as the bus explosion time and the Metropolitan Police Heli-Tele images are timestamped 09.54. These timings assume that 'over 110' injured and disorientated bomb victims manged to alight from an exploded bus in just seven minutes, a notion which stretches the bounds of credulity about as far as most other aspects of the official story. 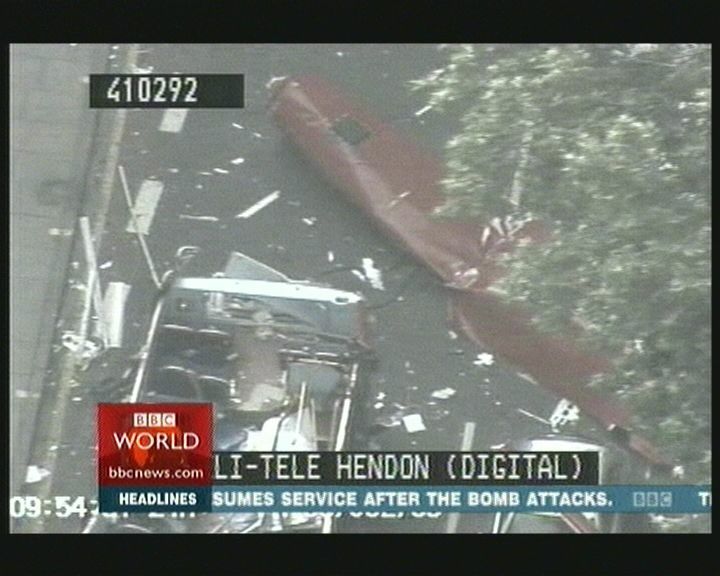 We also know that the Metropolitan Police helicopter was hovering above the scene before the explosion occurred as this is documented in the BBC footage referred to in a previous comment on this thread. With regard to the issue of having mulitple helicopters in the sky over London, a certain Mr Tony Blair was accompanied by no less than 3 helicopters during a recent visit to a school in North London, so having more than one helicopter covering a small airspace is entirely feasible. When two or more people plan to commit a crime, there exists by definition a 'conspiracy'. Therefore, any theory about who did it, or how it was done, is by definition a 'conspiracy theory'. The question is then not whether you are a conspiracy theorist, but for which conspiracy theory you find the evidence most compelling. Unless the London bombings were perpetrated by a lone individual, with no assistance, ANY theory about what happened is, by definition, a 'conspiracy theory'. My understanding is that a conspiracy theory is something which doubts some or all aspects of the official theory or explanation. Yes, the perpetrators of the crime planned or conspired to commit it in the first place, but that is different to people attempting to explain the crime after the fact. Were 110 people on the bus to 'alight' from it? The extract of the Home Office report you quote doesn't say so. Could some of that number been walking along Woburn Place/Tavistock Square near the bus? I was in London on 7th July and, along with thousands of other people, had to take to the streets that morning. I walked through Tavistock Square gardens about 20 minutes before the bus explosion happened and it is quite possible that some of the 110 people injured were pedestrians. Was the police helicopter hovering _over the site_ of the bus explosion before it happened, or was it in the _vicinity_ before it happened? It is surely understandable why a police helicopter might be hovering in the vicinity before the explosion happened, given that an emergency incident had occurred an hour earlier on the Picadilly line at or near Russell Square tube station - approximately 500 metres from Tavistock Square. If it was over the site, maybe it was a coincidence. Yes, having 3 helicopters covering the same airspace is entirely feasible. However, on 7th July we are talking about an emergency situation - very different to a prearranged school visit by Tony Blair. I'm just putting forward some points to consider and agree with you and this web site that there are many aspects of the Home Office report which are unsatisfactory.